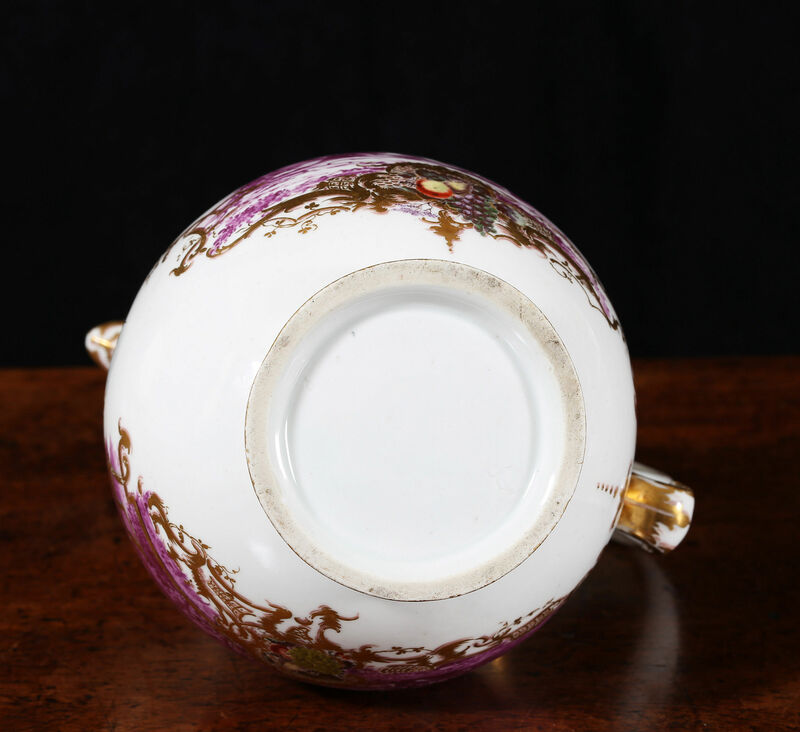 Siegfried Ducret, the great ceramic scholar, described this ‘wonderfully ornate coffeepot’ as being ‘unsurpassed in both colour and design’ when he published it in German Porcelain and Faience (1962). 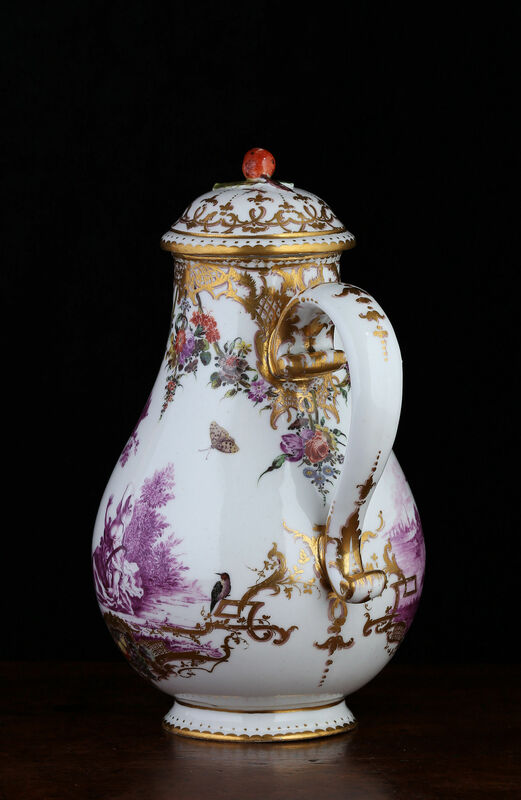 Hugo Morley-Fletcher described it as a ‘tour de force of fantasy in porcelain decoration’ in the foreword to the catalogue of the Dr Sali Gugenheim Collection when it was offered for sale in Geneva in 1995. 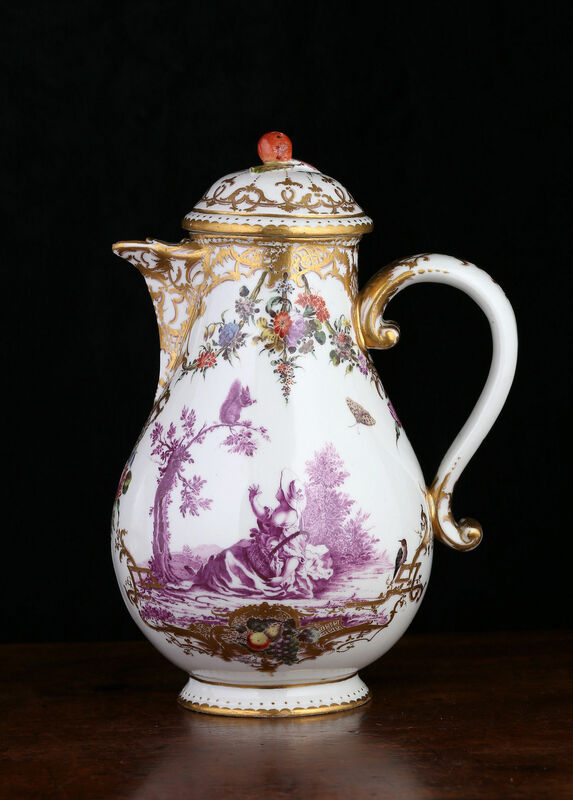 Each side is decorated with purple monochrome scenes of exceptional quality which are adapted from an engraving by Johann Esaias Nilson of around 1750 of Ovid’s Amores, Book 1, Elegy IV. The figure of the husband has been replaced by a squirrel. 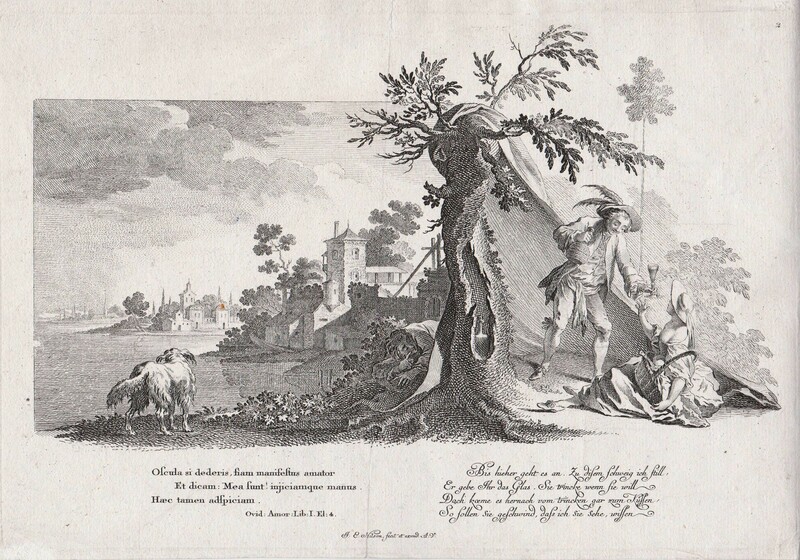 The first of these scenes depicts a girl, who has fallen over baring her shoulder, in conversation with a squirrel on a branch above her. The other shows an alert dog looking out toward buildings in a riverscape. 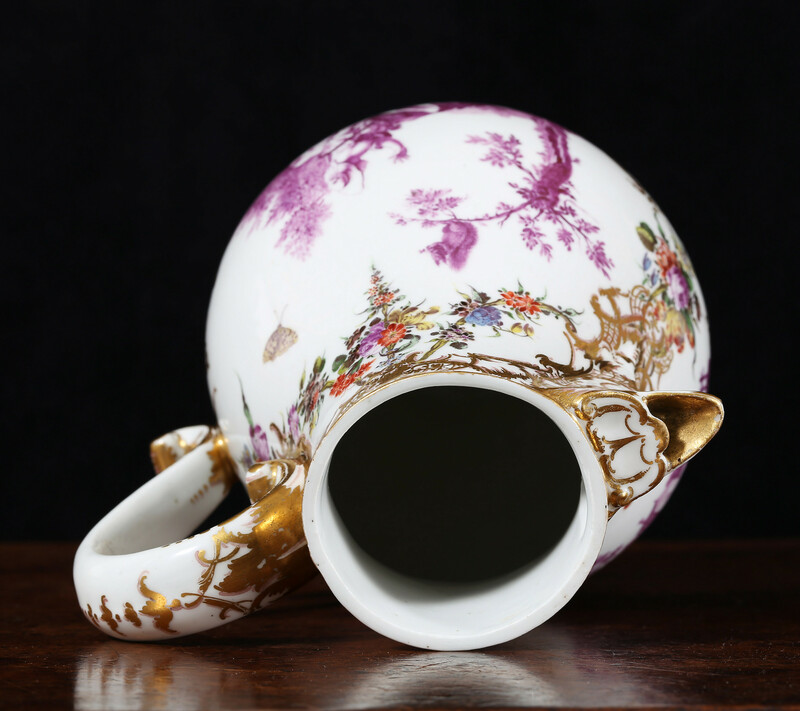 Both scenes are framed with ornate rococo gilt strapwork and polychrome garlands, fruit, birds and butterflies. 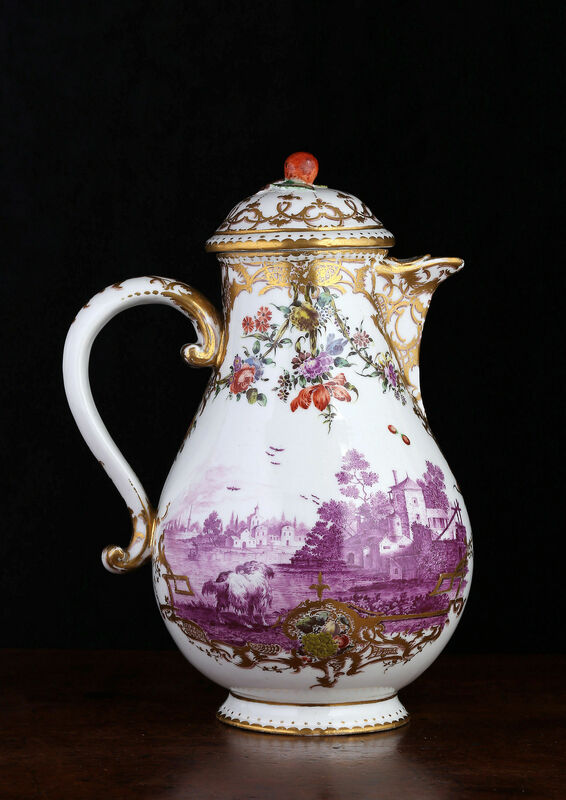 Two other works by the same hand exist in Nymphenburg porcelain; a coffee pot in the Museum fur Kunst und Gewerbe, Hamburg and a milk jug in the Stiglitz Academy in St. Petersburg. The Hamburg example has been tentatively attributed to Cajetan Purtscher, Dr. Alfred Ziffer has suggested Ambrosius Hermannsdorfer as an alternative. We are grateful to Dr. Alfred Ziffer for drawing our attention to the Stiglitz Academy piece.